Messrs. Fils-Aime, Miyamoto and Iwata of Nintendo are due to take the stage at the Kodak Theater in downtown Hollywood today, giving E3 attendees a look at what's in store for the Wii and Nintendo DS. The whole thing kicks off at 9 AM "sharp." Since these things always start a few minutes late and we've got some time to kill, join us in the comments as we await the megatons, Nintendo-style. We'll be hosting another contest in the comments for fabulous prizes, etc., so keep an eye on the liveblog for details. 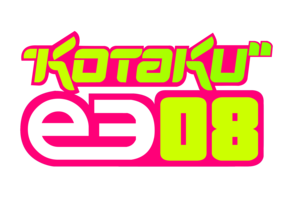 Hit the jump for our up-to-the-minute liveblog coverage of Nintendo's E3 2008 Media Briefing. Watch this liveblog closely to win FABULOUS prizes. We'll be quizzing you based on how attentive you are to what goes down, so pay attention! Once you know the answer to a question, the first person to email kotakucontest@gmail.com will be the winner (you broke the comments, jerks!). You will be disqualified unless you put what question number you're answering in the email's subject line. Easy, right?